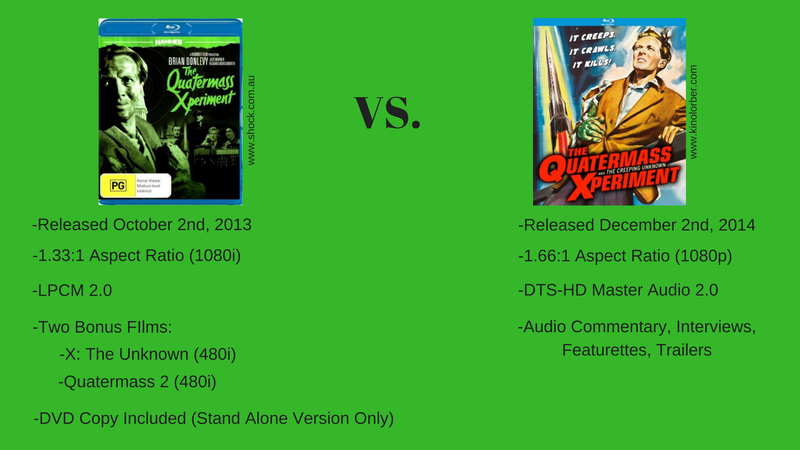 In a new feature here at The Big Movie House, we take a look at two different blu-ray releases of the same film. In this case we are taking a look at The Quatermass Xperiment, specifically the Kino Lorber release (U.S.) from 2014 and the Shock Entertainment (Aus) from 2013. How do they stack up? 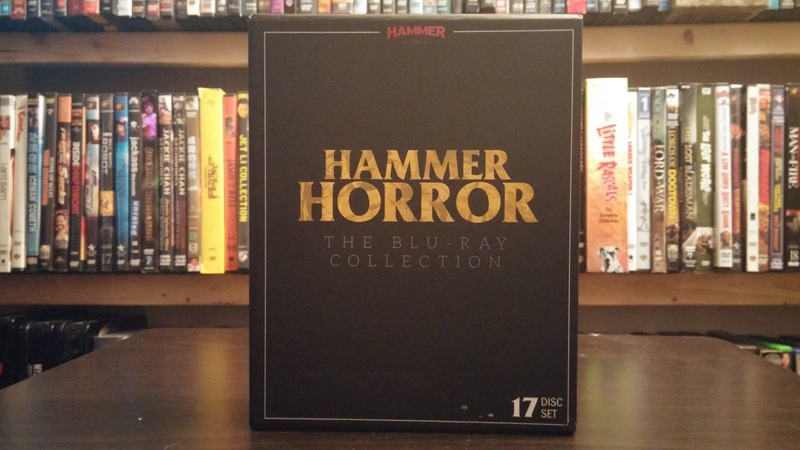 For the purposes of this review and comparison, everything that is about the Kino Lorber release will be in black font and everything that relates to the Shock Entertainment release will be in red. Carpenter has very fond memories of his first finding out about The Quatermass Xperiment (through the coming attractions at his local theater as he did not have a television growing up) and seeing it for the first time (on a double bill with a film called The Black Sleep). Carpenter then talks about the film's history and gives us some tidbits about the film that some (including myself) did not know. All in all, this is a pretty good interview and Carpenter has always had good storytelling abilities. 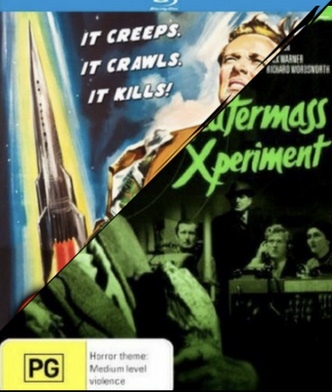 This comes from the Region 2 dvd released back in 2004 in the U.K. and has director Val Guest telling stories of the making of The Quatermass Xperiment. This is a decent "making of", but it would have been nice to have heard from others involved in the project. This featurette compares the original British version to the cut down U.S. release. 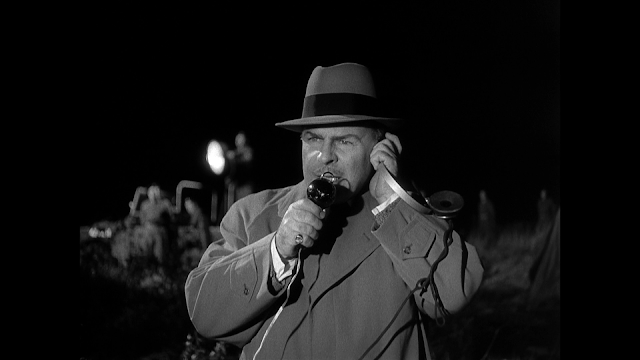 Besides the name change (In the States the film was called "The Creeping Unknown") there was about two and a half minutes cut from the film. 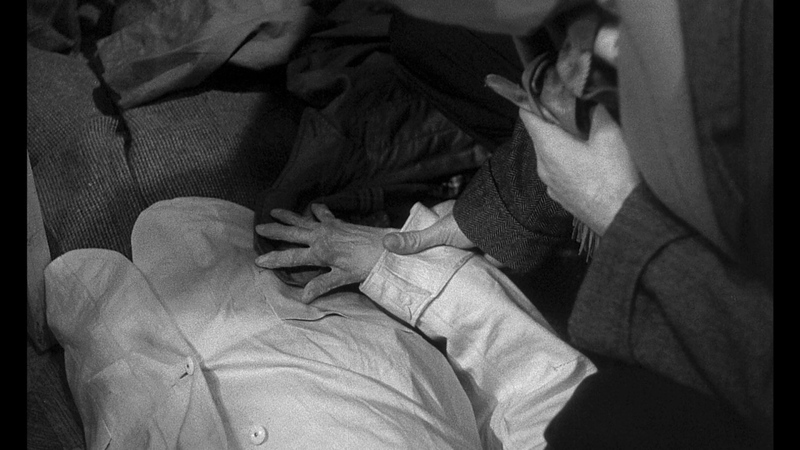 The gruesome looking face of the dead pharmacist was cut, a dialogue scene was cut, and the zookeeper leaving scene was trimmed down. When you are cutting such a short amount of minutes like what was cut here, they might as well had left the minutes in. The one thing that they don't talk about is the dubbing of Margia Dean, who plays the surviving astronauts wife. For some reason her was was dubbed in the U.S. version, even though she is from the States and possesses no accent that would make it hard for the audience to understand her, like MGM did with the first twenty some odd minutes of Mad Max. Just weird that there would be no mention of it here in a comparison video. There is really no reason to listen or watch this interview because everything that is said here has been said elsewhere on this disc. Ernest Dickerson is a director and cinematographer who got his start as Spike Lee's DP. Dickerson has photographed some of Lee's best work, including Do the Right Thing and Malcolm X. Dickerson has also directed his own films including Juice, starring Tupac Shakur, and the first Tales from the Crypt film, Demon Knight. Here Dickerson talks about the film's impact on him and gives us some trivia about the film. This is the set of title cards that were used on the U.S. print of the film when it was known as The Creeping Unknown. Surprisingly , there is no music to go over these credits. This is the U.S. trailer for the film and it gives away the ending of the film with the first few moments of this trailer. It is also in a different aspect ratio than what the film is in proper. Neither film has any chapter selections and has to be watched all the way through or has to be fast forwarded to the part that was last seen. The front cover features the film's theatrical poster in all of it's glory. It is one hell of a poster and is very welcome here. The front cover also informs us that of the film's U.S. title. 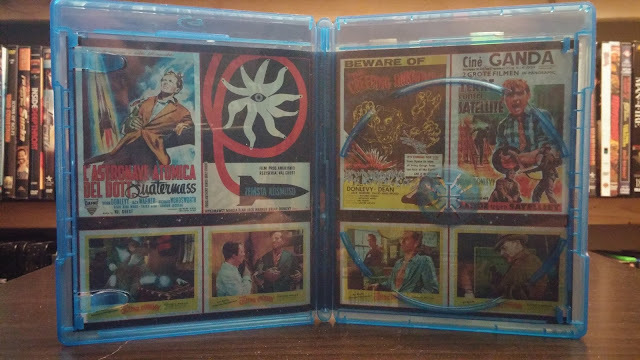 The back cover is mostly black except for the special features box. We get two stills from the film, a plot description, and technical info. The poster credits are right underneath the special features box. The inside cover features four posters from around the world and four lobby cards. 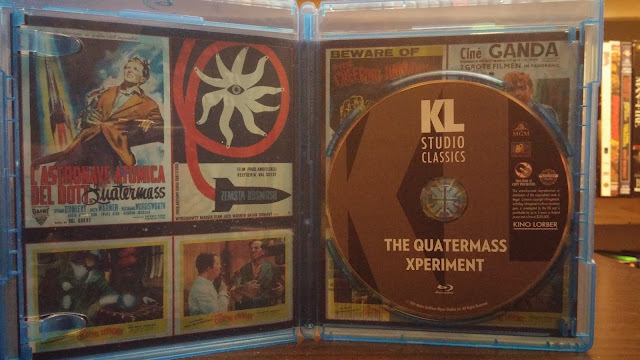 The disc features a big "KL" (for Kino Lorber) as the background. At the top of the disc reads: KL Studio Classics and then the title below it. Very plain looking disc art. 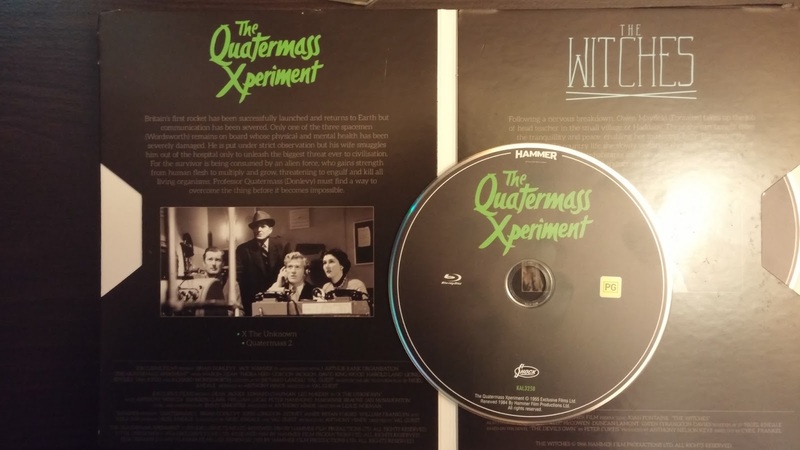 The Shock Entertainment release of The Quatermass Xperiment was released on it's own, but was also packaged inside of the Hammer Horror: The Blu-ray Collection box set that was released in Australia and houses 14 HD films, 2 SD films, and the World of Hammer: Complete Series is SD as well. The box for this release is big and bulky and the pages that hold the discs are too tight, which could lead to scratches on this discs, but I love this release. Sure, the packaging is a bit rough on the inside, but when that set sits on the shelf, all other sets around it look quaint in comparison. Each page includes information about the film, including plot description, a list of the disc's special features, and tech info. It is a marvelous collection, but some of the films in this collection have been released in other countries with better transfers and features. The Quatermass Xperiment is one of them. If you can get this set cheap then buy it. The disc art is decent with the an all black color scheme. The title resides at the top of the disc in it's original font, an Australian rating box sits below and to the right. 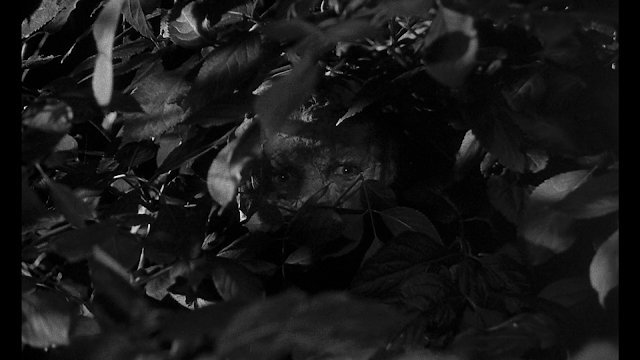 The Quatermass Xperiment is a great looking film, with incredibly moody black and white photography and Kino Lorber do a really good job with it. The print is, for the most part, clean and sharp with some dirt and scratches showing their ugly head every once in awhile. Blacks are very deep and there is no pixelation or encode problems. Detail is nice in closeups and there is a fine layer of grain that gives the transfer a film-like feel. There is some flicker that comes and goes as it pleases, but it doesn't stay around for too long. 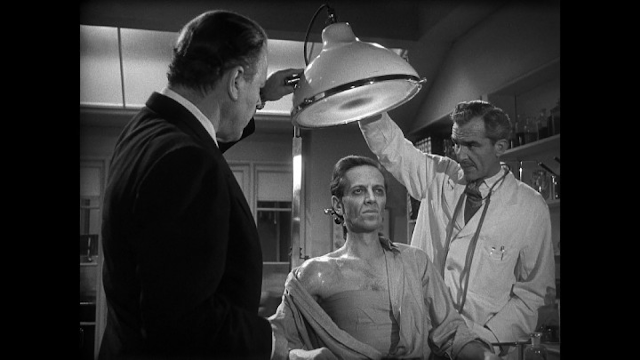 Shock Entertainment has given The Quatermass Xperiment a nice transfer with many of the same high points as it's American counterpart, but there is no film grain, meaning that it has been removed. So that means that there was some DNR applied to this release, although it was wisely used as detail in closeups is still there. The film also has a weird feeling to it, like it isn't a film, more like it is a made for tv product. This transfer gives the film that feel and it is very apparent when watching the two transfers back-to-back like I did. 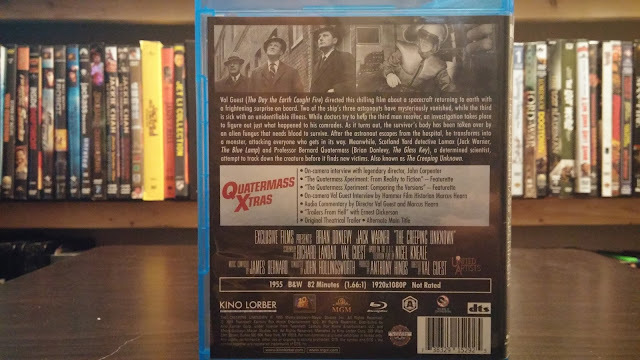 The film is also presented in a 1.33:1 aspect ratio unlike the Kino Lorber version that is presented in the film's original aspect ratio of 1.66:1, although it appears that the Shock Entertainment version is presented open matte instead of being cropped. There is more information at the top and bottom of the frame. Kino Lorber has provided a DTS-HD Master Audio 2.0 track for the film and it sounds very good. Dialogue is clean and crisp while the sound effects are well handled. The score, by James Bernard, comes through loud and clear and helps with the atmosphere created here. The LPCM track, provided by Shock Entertainment, is also very good. There is one thing that makes this track different from the Kino track, other than different encoding, and that is the inclusion of the dubbing of Margia Dean. It is hinted at in the interview with John Carpenter on the Kino disc, where a short clip of the dub is played, but here it is in all of it's glory and it is awful. She never sounds like she is in the same room as any of the other characters she interacts with and she sounds like a dumb southern belle. I am glad that this is included as it gives us a chance to hear the dub in the film proper. While watching The Quatermass Xperiment, I was reminded of another film that featured a lot of the same ideas and, sometimes, scenes, and that was The Incredible Melting Man from 1977. In it, a crew of astronauts are exposed to cosmic rays outside of the rings of Saturn. The shuttle returns with only one crew member alive. While under care for the changes that have happened to him, the astronaut escapes and begins to melt. He begins to eat people he comes across in his escape from the facility. The only person that can stop him is Dr. Ted Nelson. These two films not contain very similar plots, but there is also one doctor that thinks that they can help. Both films are also pretty gruesome, with Melting Man winning, but not by much as Quatermass is still pretty gruesome. Quatermass is also a film that is taken very seriously, with any camp that has popped coming well after the film's release. The stillness of the astronaut in any of his scenes is disturbing and creepy. 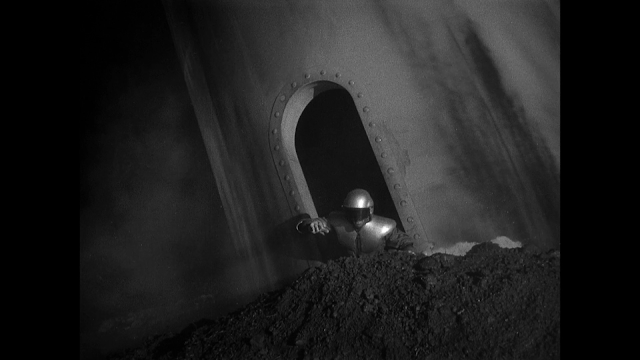 When the astronaut does start attacking, it comes as a shock because we feel that Quatermass might actually be able to help him. 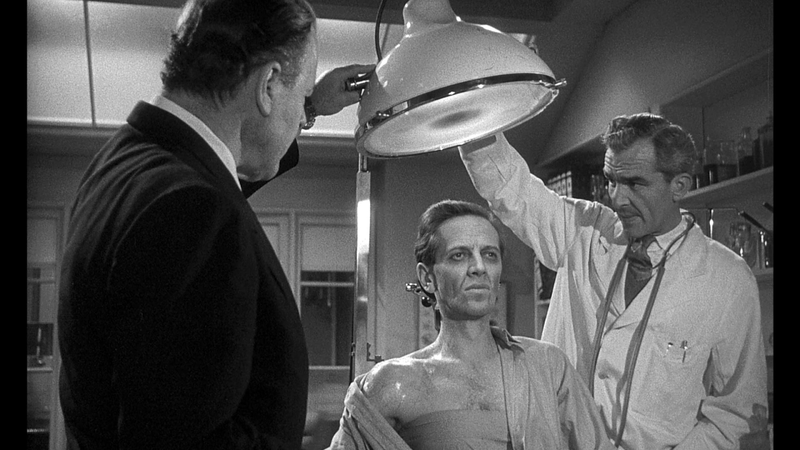 The final transformation, seen at the end of the film, may not be shocking anymore, but it sure was back in the 50's. We had never seen anything like that before. Now we can see this one regular broadcast tv. The score by James Bernard is very effective. He uses music, not to calm us or put us at ease, but to creep us out and to scare us. There isn't anything in his score that allows for a moment of peace and he is able to keep this feeling of unease going throughout the entire film. 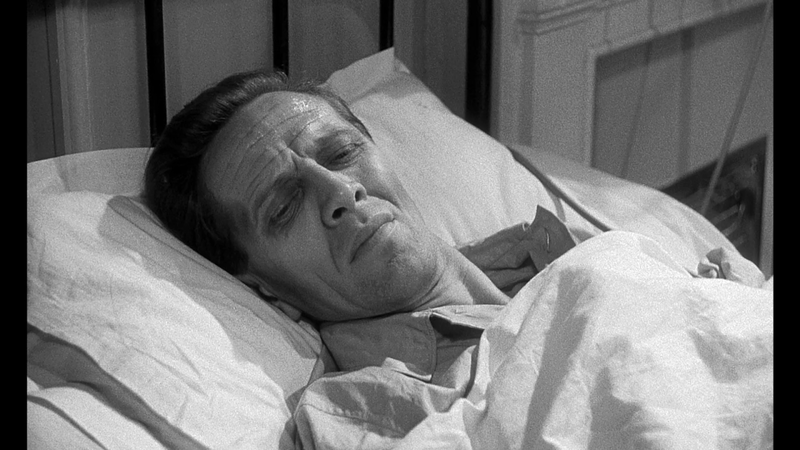 The Incredible Melting Man is just plain camp that was there from the beginning. There is no way that anyone old enough to see this film would take anything that happens in this film seriously. The film is fun, but suffers from a distinct lack of much going on. 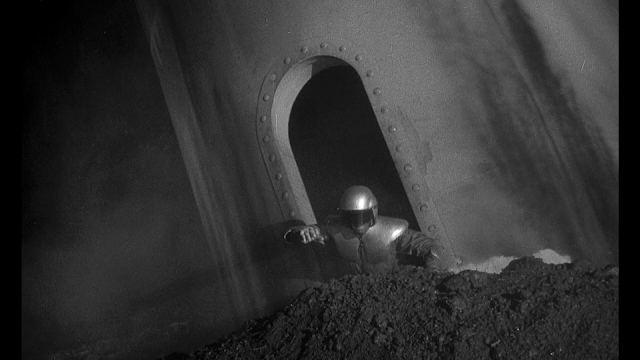 Outside of the Melting Man himself, there isn't too much to be had in this film. That is the exact opposite of The Quatermass Xperiment. While the film does have a bit of a lull in the middle, the film isn't harmed too much by this and is able to keep it's feeling of unease through it. We want to see what happens to the astronaut, we want to see if Quatermass can save the day. 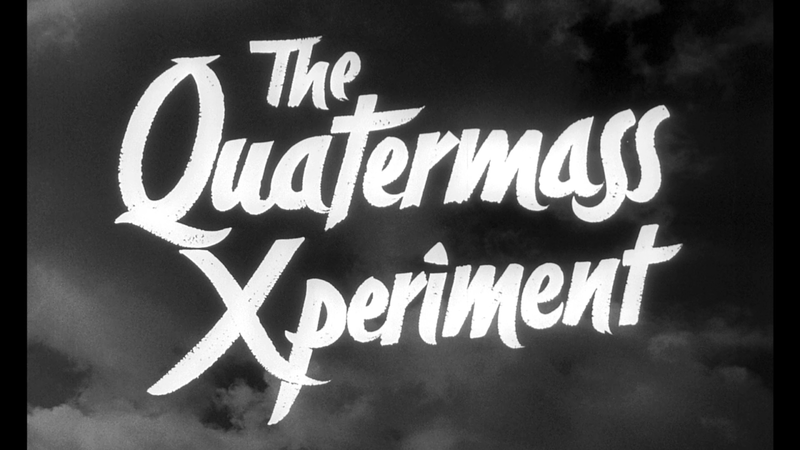 The Quatermass Xperiment is a really good film that should have been better if the pace had been picked up a little. The film is only 82 minutes, but that lull I was talking about makes the film seem a bit longer. Still, the film has a lot of talent on display from all departments and shows that you don't have to show much to scare us to death. 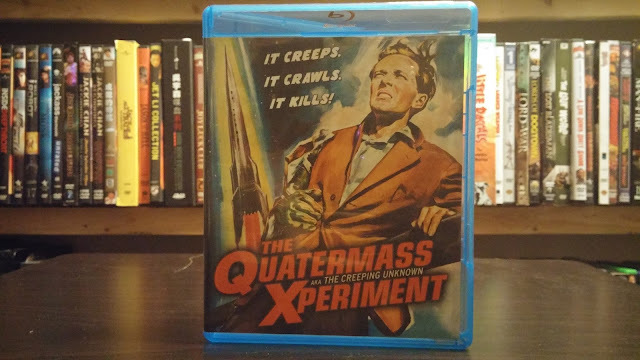 I had fun watching The Quatermass Experiment. It is a creepy chiller that gives us everything that we need to enjoy this well-made monster movie. The Kino blu-ray is great. The film looks and sounds wonderful and the special features are worth at least a watch. 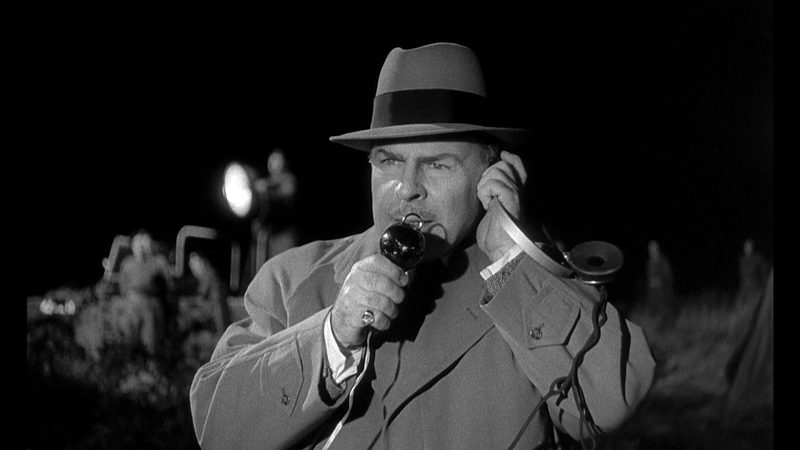 The Shock Entertainment blu-ray has its flaws. The picture quality is good, but that feeling of a made for tv film that I got from it is still nagging at me and thus, I will have to give the disc a slightly lower grade because of it. The sound is fine and is the only time, that I know of, to hear the terrible dub they did on Mariga Dean. The disc does have two other films on it: X: The Unknown and Quatermass 2. For my money, I would go with the Kino Lorber disc. It is the one with the best A/V qualities and the most features in the special features department. The Shock disc does have the two other films on it, but the film proper is hindered.